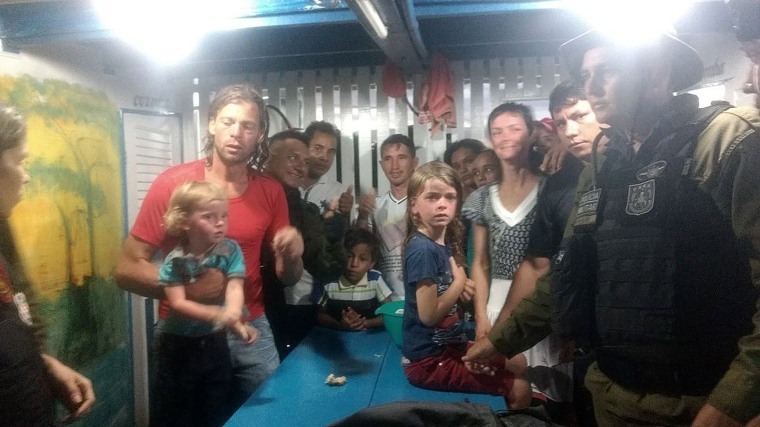 SAO PAULO — A California couple and their two daughters who had been missing since Sunday when pirates attacked their boat in the Amazon River delta area have been found alive. Except for insect bites and scratches, Adam and Emily Harteau and their 3- and 7-year-old daughters were in good condition and will spend the night in a hospital in the small city of Breves, not far from where they were found, law enforcement officials in Brazil's northern jungle state of Para said Wednesday. The Harteaus were headed to Breves when gunmen boarded the boat they were on and forced it to go the city of Porto dos Dias, said Sergio Chene, a spokesman for Para's Public Safety Department. There crew and passengers were held hostage for several hours and stripped of their personal belongings before the pirates fled, Chene said. When police arrived there was no sign of the Harteaus. Police found the van the family had been using in their journey abandoned in the jungle. It's unclear how the family escaped the assailants. Colby Guillory, a Los Angeles resident acting as a family spokesman, said friends and relatives think the Harteaus decided to flee the boat to get away from the pirates and have been walking in the jungle since. "Me knowing Adam, he probably took it upon himself to save his family," Guillory said. "We just know that sometime between pirates overtaking the boat and leaving the boat, (the Harteaus) went missing. We think they jumped." When Guillory heard his good friends were safe he said he began "super excited ugly-crying." "We just can't wait to have them home," he said. Adam Harteau's brother, Keith Harteau, told The Associated Press earlier that the attack happened as the family was on its way to move back to California. They were set to arrive in Los Angeles on Nov. 15. Keith Harteau said the couple wanted to be closer to home and for their girls to be near their family. "It was their time to get a little bit of foundation," he said. He said Emily Harteau grew up in Sacramento and Adam grew up in Juniper Hills in the San Gabriel Mountains just northeast of Los Angeles. The Harteaus had recently been living in the southern Brazil city of Florianopolis. They have been using a website to document their journey around South America, which began in 2012 as a plan to travel to Patagonia in their Volkswagen van and return to California one year later. But the Harteaus fell in love with South America and have been there since after they "decided to embrace a future unknown and the rewards of slow travel," according to their site, which says Adam is an artist and Emily a fashion designer. They wanted their site to "serve as a modern family portrait, as they shed their robes of comfort to re-examine the American Dream." "They hope to inspire others to create, eat well, spend quality time together, and adventure into their own great backyards," the site says.